These are my original songs that I wrote, composed, recorded, produced and sang on. I think it's important for singing teachers to be able to prove that they can do what they talk about. When I first started singing I couldn't sing any of this stuff and had many songs written that were waiting on vocals. It took me many years until I was able to build up the technique to actually do this stuff - especially my newer tracks that I am now doing live in one take. If you'd like to learn how to sing live with more freedom and consistency then click here to begin. I created this Drake Nice For What Cover in 2 days from scratch. All vocals, instruments, recording and producing. It was a great exercise to see if I could take a popular new song that I had never heard before, in a style I don't listen to and see if I could turn it into my own style and get it up within 2 days. Here is the result. I'm always up for experimenting with different sounds and ideas to see not only what I can do but also to see what sticks for people. I'd love to hear your feedback on this! 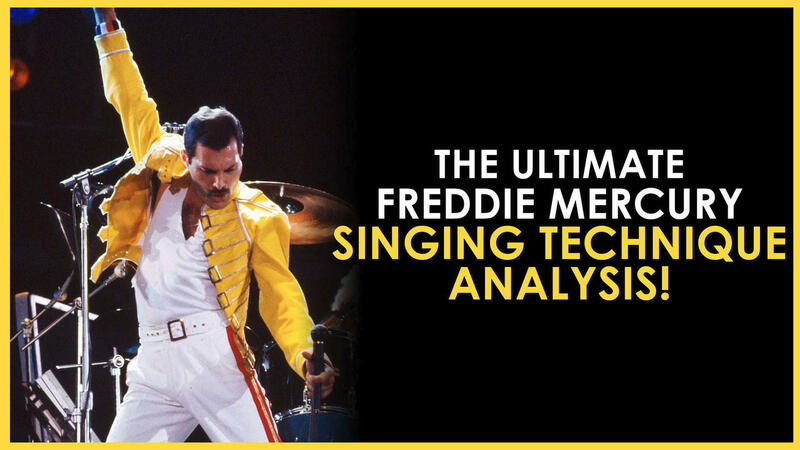 The ULTIMATE Freddie Mercury Singing Technique ANALYSIS! 01:15 Was Freddie a baritone or tenor? Here it is - the behind the scenes breakdown of how I created the heavy, pumping RnB track I'VE DRAWN A LINE. Pt1 - I show the very early concept stage of the song, how I composed it and how the song changed over time. Pt2 - I show how I produced and mixed the track. Pt3 - I break down my vocal technique and how I was able to perform it live in one take with relative ease. I also show some of the mistakes I did and how to improve on them. I hope you enjoyed the break down of my latest song. If you found it interesting and have a comment or question don't hesitate to let me know and I'll try to get back to you. If you'd like to learn how to sing with more ease and consistency then hit me up for a Skype lesson or get your hands on my self-training singing program. Being unable to sing higher than a D4. Giving up singing for 10 years because he thought he would never be able to get better. Feeling insecure about his voice. Expanding his vocal range drastically and being able to use it in actual songs, not just scales. Releasing an album and building a side-business out of his music. Feeling confident and secure with his singing. "Dude I just feel super insecure about my voice." He told me he struggled to sing around his bridge area (E4-F#4 area) so we worked a lot on it. You'll see how we did all that in the above singing transformation video. Hi, I hope you enjoy my version of John Legend's All Of Me. What you see here is a single live take with no punch-ins or lip-syncing. I wanted to give this song more of a "swingy jazz" kinda vibe with the rhythm but keep the song fairly stripped back, hence the acoustic nature of it. I came up with the chords for this about a year ago and just did nothing with it! Then a few weeks ago I recorded the guitars and started working out how I wanted to sing over it. If you enjoyed this performance please share it with your friends and leave a comment!